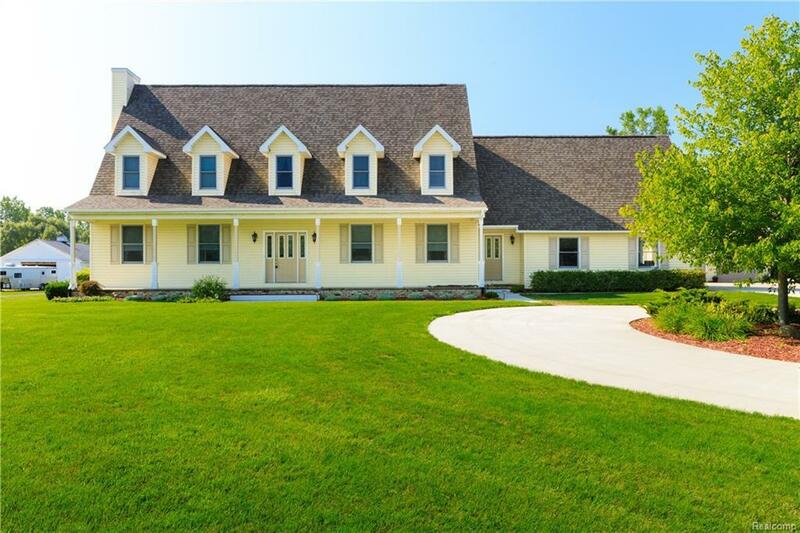 This custom built cape cod sits neatly on 3.4 acres is beautifully appointed and lovingly maintained. Offers over 3,000 sq ft of updated living space including eat-in kitchen with HW floors, quartz tops and upgraded fixtures (appliances stay), formal dining and living room with loads of natural light all overlook the serene pond and tiered no-maintenance deck. Master suite has gas fireplace, walk-in closet, vanity area and private full bath. Jack & Jill bath connect secondary bedrooms. Larger bedroom has attached mother-in-law suite w/kitchenette and living room. Fully finished basement with bar, entertainment area, full bath, exercise/rec room and large storage room. Second garage with huge loft area, tons of storage, insulated doors and work space round out this stunning home. Updates: A/C 2011, water Heater 2017, well pressure tank 2015, well pump 2011, sump pump (with back up) 2016, roof (house) 2012 and much more. The pictures dont liethis is the one you have been waiting for!